The materials I offer in these pages must stand or fall on their own merit, but if I were you I would want to know something about the person who has prepared them. So here is a brief summary of my qualifications and experience. I studied Spanish and French at London University before going on to do a PGCE in Modern Language Teaching. Instead of looking for a school teaching job, I went to Sweden to teach English and have been involved in EFL ever since. That was some time time before the RSA Certificate/Diploma started, let alone the Cambridge TEFL qualifications. After three years in Sweden I did a Post-Graduate degree at Edinburgh in Applied Linguistics and then joined West London College where, among other things, I taught on one of the first pilot courses for the RSA Certificate and later provided a revised methodology syllabus for that qualification. I moved to South Devon College to set up the EFL unit there and spent ten happy years in the warm South-West of England before being persuaded back to London to join Pitman's in a management role. After two years in the private sector I joined what was then The City of London Polytechnic as Head of Languages. During the eleven years I spent there we became London Guildhall University and I moved sideways to become Director of the Language Services Centre which I had set up as an income-generating unit engaged in general English, English for Business Purposes and Teacher Training for Business English. London Guildhall University has now become London Metropolitan University, but that's another story. Throughout my full-time teaching career I was involved in examining for Cambridge, the RSA and the London Chamber of Commerce as well as teacher training, both in-house, and externally for The British Council (courses in what used to be Yugoslavia, Austria, Bulgaria, Hungary, Morocco and Thailand). At London Guildhall University I started training programmes for Teachers of English for Business Purposes which we taught in London and also in Moscow and Budapest. 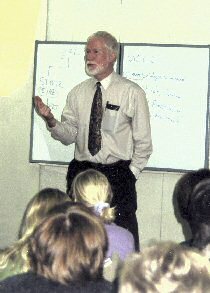 I continued to run teacher training programmes for London Guildhall University for a couple of years after taking early retirement and since then I have undertaken teaching and teacher training assignments, initially for British Executive Services Overseas and then for VSO after the two organisations merged. So far I have worked in Peru, Kazakhstan, Russia, Azerbaijan, China, Ukraine and Tanzania.